I think this is secret code for "Don't worry about washing your hands if no customers are around, but if they are in the bathroom, at least run the water for a few seconds and make a good show of it." You can catch Dustin's website at http://dustincharles.wordpress.com/. 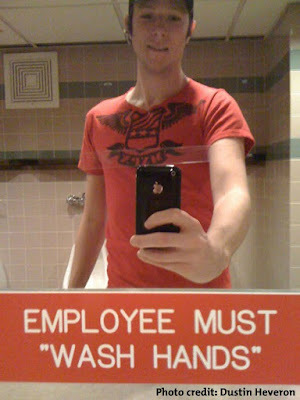 this is much funnier than the caption i came up with, though i'm still most worried about how they know which "employee" (note the singular use of the word) is the one who's supposed to fake wash up.